The M49 was a multipattern large-diaphragm tube microphone with an important new innovation: the mic’s pickup pattern could be adjusted remotely, by a dial on the power supply. Another new innovation was that the mic maintained nearly equal sensitivity and output level across patterns — unlike the U-47, for example, which was 5dB hotter in Cardioid than Omni. Maintaining output level required a change in the polarization voltage circuitry. Whereas the U-47’s circuit would disconnect the capsule’s rear diaphragm in Cardioid mode, in the M49 both diaphragms were always polarized — the front at a constant 60Vdc, and the rear from 0Vdc to 120Vdc. When set to Cardioid, the rear diaphragm polarization voltage was 0Vdc. Neumann built various versions over the years. The first M49 was built during 1949 and used the M7 capsule, which was also used in the U47. In 1951 the omni version M50 came in production, first with a similar goldplated PVC capsule as the M7, (KK50). Both microphones used the MSC2 vacuum tube. Neumann replaced this tube after 1954 with the low noise Telefunken triode AC701k for the M50 and after 1960 for the M49. With the change to the new AC701k tube, Neumann also changed the capsule in the M49 to the PE/goldplated diaphragm and in the M50 to a rather unusual aluminium diaphragm capsule (KK53) and than later, in 1965 also to the PE/Gold diaphragm (KK83). From 1961 Neumann also produced the M249 and M250 version with the smaller 7-pin Tuchel standard connector as used in the U67. The M249 was produced until 1974. 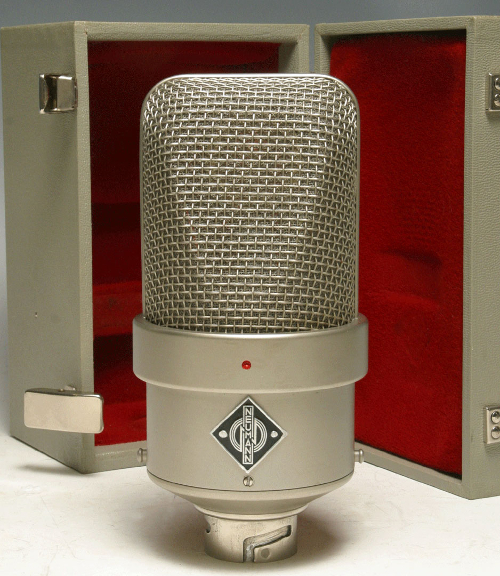 Do you have content, to add, about the Neumann M49 Microphone or associated topics? Please feel free to Share it, here!